In the recent past, international and local Non-Governmental Organizations (NGOs) have increasingly played a vital role in humanitarian relief operations in various parts of the world. Currently, there is a call for proper coordination between international relief agencies and local organisation and institutions to ensure efficient delivery of relief, rehabilitation and reconstruction of disaster affected communities. This research explores inter-agency coordination in humanitarian response to disasters and emergency situations with specific reference to the 2007 floods in Northern Ghana. 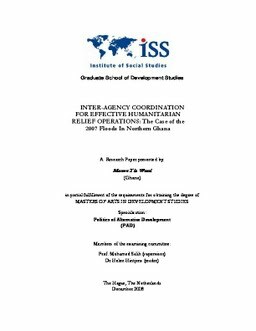 In particular, the research explores the inter-agency coordination efforts in response to the disaster with regards to three factors: initial conditions, the process of coordination itself and structural administration. The research looks at how coordination efforts affect the eventual outcomes of the humanitarian response. It also examines the relationship between international and local organizations and whether this relationship enhanced the targeting and delivery of humanitarian relief. Semistructured interviews with managers as well as group discussion with members of the affected communities formed a central part of the research method. Evidence from this research suggests that the inability of local implementing partner organizations to target the most affected communities for relief assistance can be as important in explaining an unsatisfactory relief response as poor and inadequate coordination among the various agencies and actors involved in relief operations. Even if there were proper coordination among the participating organizations to achieve synergy, the lack of proper targeting at the distribution end can result in minimally effective outcomes. Consequently, organizations should seek to improve inter-agency coordination and at the same time to improve the capacities of local implementing partner organizations to properly target and effectively distribute relief assistance to those who need it most.